One of the insights of the Reformation that is sometimes overlooked today is its articulation of the biblical doctrine of the communion of the saints. Not only was it an important doctrinal issue, being one of the twelve points of the Apostles Creed, but it was one with immense implication for Christian life and community. The Reformers rejected as unbiblical the idea that the communion of saints allowed the saints to share their merit with others, or that we can or should communicate with the deceased by prayer. They critiqued the idea that only certain believers were saints, emphasizing that all Christians are saints. Yet, they did see the communion of saints as not only a true doctrine, taught in passages like Romans 12:4-8, Ephesians 4:1-6, John 15:1-12, Acts 2:42, and 1 John 1:1-7, but they also viewed it as a great benefit to believers. John Calvin summarized the doctrine by saying that “saints are united in the fellowship of Christ on this condition, that all the blessings which God bestows upon them are mutually communicated to each other" (Calvin, 4.1.3). This meant that by being a member of Christ, one could claim a share in all God’s promises to the church. Even the diverse gifts of the Spirit were given to us to be shared with each other. Calvin saw this as an important means of assurance and consolation that enabled the individual believer to appropriate to one’s self all the blessings God bestows on His members. Calvin described it as an aspect of the invisible church, a unity received and perceived by faith. This describes two parts, the indicative (what is) and the imperative (what should be). We share in Christ’s riches and gifts together, therefore we should use his gifts for each other. Unlike the medieval doctrine of the communion of saints, which led Christians to seek help from the dead, the Protestant doctrine taught them to give help to the living. When we come to the Westminster Confession of Faith (1646), we can recognize the same indicative/imperative pattern. 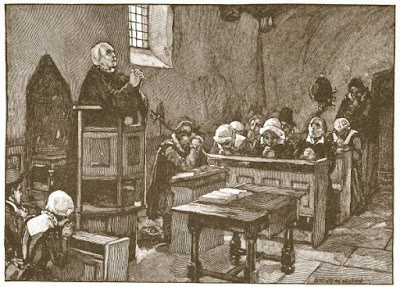 While the Westminster Confession is unique among statements of faith in having an entire chapter on the doctrine, the first section of chapter 26, “Of the Communion of Saints,” is essentially a restatement of the answer of the Heidelberg Catechism. This argues that believers share in Christ’s benefits by virtue of their union with Him, and that they should use Christ’s gifts for the sake of each other. This is not a mere duty, but a duty supported by a fact: “they have communion in each other’s gifts and graces.” To have communion is to share something in common. We are each stewards of the grace given us, but all of it belongs to all Christians. The second section of chapter 26 specifies the actions to which this communion binds us: common worship, mutual edification, and outward relief. It is to be extended to “all those who, in every place, call upon the name of the Lord Jesus” because this obligation rests on our union with Christ. This paragraph realizes that we are limited as finite creature by our abilities and opportunities, but it rejects boundaries of denomination, race, geography, and age. Union with a particular congregation is important for the fulfilling of these duties - indeed, the creation of local congregations is an outworking of these duties - but this communion is not restricted to them. The foundation is Christ. The third section adds two important qualifications. This union does not imply that we become divine, nor does our communion with the saints mean that private property is abolished. Once one realizes the meaning of communion – that we have a claim to each other’s gifts – it becomes clear why private property would seem threatened. Anabaptists and others were ready to take this doctrine to what they saw as the logical conclusion. Yet, this qualification is not only valuable in practice, but also biblical (Acts 5:4, 2 Thess. 3:8, Eph. 4:28). Among the Puritans who wrote the Westminster Confession of Faith, the communion of saints was applied as a way of life and conduct. Diane Willen, in her article, "'Communion of the Saints': Spiritual Reciprocity and the Godly Community in Early Modern England," argues that the doctrine of the communion of saints and its application through mutual edification became an important feature of Puritan spirituality, and one that encouraged a flourishing reciprocity among the laity. As Thomas Gataker, a member of the Westminster Assembly, would write, "For as there is none so learned, but he may learne something from the very meanest, even from those that bee farre inferiour in gifts to himselfe" (Gateker, 59-60). Edification was not a one-way street – everyone was called to participate. This doctrine gave women an important and active role, since, in the Puritan community, “spiritual counseling and edification assumed a surprising degree of reciprocity between men and women” (Willen, 40). Christians were not expected to be dependent upon the pastor for all edification, exhortation, and encouragement. Rather, the conversations, letters, and family gatherings of believers were to be opportunities to apply the duties of communion. “we must be willing to abridge our selves of our superfluities, for the supply of others necessities, we must uphold a familiar commerce together in all meekness, gentleness, patience and liberality, we must delight in each other, make others conditions our own, rejoice together, mourn together, labor, and suffer together, always having before our eyes our commission and community in the work, our community as members of the same body” (Winthrop, 18). Thus, this doctrine would flourish and influence social life in Great Britain and early America for a time. Yet the communion of saints would decline as an important theological point in the 18th century. Not only did the Enlightenment privatize Christianity and cede the public sphere to natural principles, but the polemical debates concerning church government, liturgy, and sacraments would nearly monopolize some discussions of the church in the British and American traditions. Today it is more common to disparage organized religion and social duties, and to emphasize personal freedom and autonomy. American Christians, in their tendency towards individualism, have forgotten Winthrop's exhortation. Many heirs of the Reformation have developed a "me and Jesus" piety which would trouble the Reformers (not to mention the Apostles). May Christians of the 21st century learn from our Reformation forefathers, recover an understanding of this biblical doctrine, and zealously implement it with love for Christ and His people. Calvin, John. The Institutes of the Christian Religion. Peabody, MA: Hendrickson, 2008. Gataker, Thomas. The spirituall watch, or Christs generall watch-word: A meditation on Mark 13.37. Printed by John Haviland for William Bladen, London, 1622. Willen, Diane. ""Communion of the Saints": Spiritual Reciprocity and the Godly Community in Early Modern England." Albion: A Quarterly Journal Concerned with British Studies 27, no. 1 (1995): 19-41. Winthrop, John. “A Model of Charity.” The American Patriot’s Handbook, ed. George Grant, 8-19. Naperville, IL: Cumberland House, 2009.